This stunning 12-light Crystal Chandelier only uses the best quality material and workmanship ensuring a beautiful heirloom quality piece. 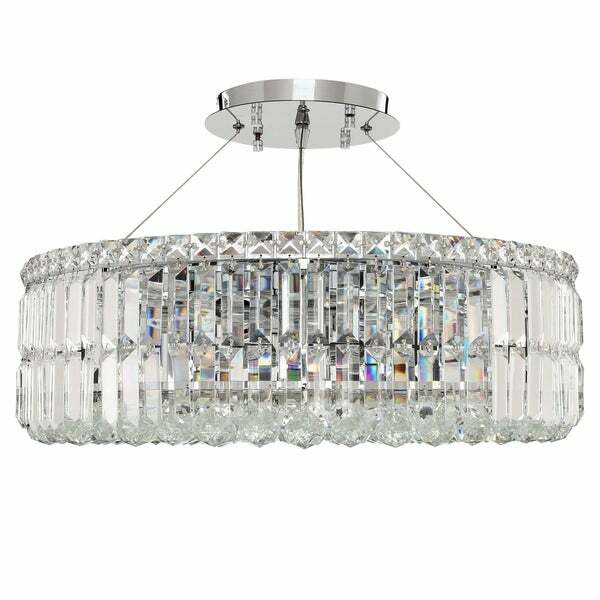 Featuring a radiant Chrome finish and finely cut premium grade clear crystals with a lead content of 30-percent, this elegant chandelier will give any room sparkle and glamour. Dimensions 24.0 In. X 24.0 In. X 7.5 In. "Hi. Two questions 1. Can this be hung from a vaulted ceiling? 2. What is the maximum length this can be hung from ceiling?" "Is this a maxim elegant chandelier?" we are unable to disclose the manufacturer of some of our products. Overstock.com stands behind every product we sell. "How wide is this chandelier?" Hello cowboyjoe77, this chandelier is 24 inches in diameter. Thanks for shopping with us!